Neil’s Perky Pups was a gift quilt for my cousin’s first baby. I knew I wanted to use those cute pups and dots from Heather Ross, but couldn’t figure out which color to use for the solid strips between the pieced strips. After a long search I settled on the mousy gray (it looks more brown in the picture) that the saleslady thought wouldn’t look very good. I think I’m happy with its understated-ness. This quilt is traditional with its patched strips, but also has modern elements too, like the varied strip widths and bold linear theme. I usually embroider the baby’s name on the quilt top, but this time stuck with a simple ‘N’ for Neil. The binding is a vivid aqua and the back is a soft natural flannel. 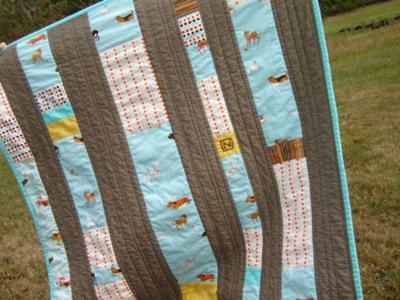 All the fabrics, including batting, used in this quilt are 100% cotton. It’s machine-pieced and –quilted, is about 34 x 40”, and took 5-6 hours to complete. I think you made a good choice going with the grey.